Just over two years ago, Mark McGregor joined the Signavio team as Head of Strategy. To celebrate the occasion, Mark offered some thoughts about the past and future of BPM, the changing nature of the market for BPM tools, and the importance of effective customer focus using customer journey mapping. Below is part one of this wide-ranging interview—check back next week for part two. Hi Mark! Before you joined Gartner as a Research Director in 2014, you said you wouldn’t go back to working with a software vendor. Then when you left Gartner, you made it known that you were retiring. So, why the move to Signavio? So the tough questions right off the bat! It is certainly true that after more than 25 years working with most of the major modeling tool vendors; I was pretty disillusioned with them. There are thousands of organizations that still need to become more process centric and would benefit from what modeling tools can offer: They have problems that are best captured, analyzed, and acted upon based on what a modeling tool can do. Yet, over that same period vendors had not really moved forward fast enough to keep pace with the changing needs of a modern business. Quite frankly, I was fed up with some vendors who just seemed to be doing everything possible to add features and dress up old software as new, and not watching the changing market. At the same time, I was contacted by Gero (Dr. Gero Decker, Signavio’s co-founder and CEO), someone I had known for many years, ever since writing one of the first analyst reports on Signavio, back in 2009. (Note: You can also download a much more recent analysis of the Signavio Business Transformation Suite.) He suggested I would be bored in retirement and talked passionately, as he usually does, about what was happening at Signavio, including the growth plans, and why I should come on board. As history shows, I resisted but did agree to do some webinars and consulting work during 2017. Little did I know that this was just a ploy to let me see more of what was going on inside Signavio, how great the team was, and how the passion went far beyond the CEO! So yes, I agreed to become part of the Signavio team. Fast forward to now, and I am truly impressed by what has been achieved over the last couple of years. To be part of a team that has seen revenues triple in that time is amazing, and I am very excited by what will happen in 2019. Just one example of Signavio being different is that “process for everyone” mantra; I see Signavio taking process deeper and wider into organizations than any other vendor I have known. The knowledge that over one million people worldwide access and use the content created by Signavio modelers is astounding, not to mention evidence that success in process only happens when you stop thinking about just modelers and modeling. So, you’ve been pretty heavily involved with the modeling market for the last 23 years, and we know some of that time was in the enterprise architecture and software engineering sectors. But we also know that in addition to process modeling you have plenty of experience in the broader Business Process Management field. Given that BPM and BPM tooling has been around for over 20 years, have we now moved away from innovation and on to simple adoption? In other words, do you think the market is saturated with organizations simply switching from one vendor to another? Well, it is true many organizations are switching from one vendor to another—take a look at the customer wins for Signavio in recent years. Doing so reveals over 100 customers who have chosen to switch from their legacy, difficult-to-use, on-premise tools to Signavio’s easier-to-use SaaS products. This certainly reinforces the idea that there are people switching suppliers, and at a faster rate than ever before, but, as you read again what I said, you will see that the reason they switched was because the alternative was more innovative, more modern, and better suited to solving the problems they have today. Conversely, those 100 customers represent less than 30% of the new customers Signavio signed last year, which means that the market is far from saturated. I suggested some time ago that if the right vendor comes up with the right product, to solve the right problems, at the right price, then there is a massive amount of potential new business in the marketplace, and I am happy to see that Signavio has been proving that point. However, it has been my experience that incumbent vendors are slow to see change, slow to invest in new ways of working, and quick to cling on to the past for as long as possible. Modeling tools or automotive companies, take your pick, Tesla, DHL, and Delfast are leading the way of the future, not the traditional players. This will be true for all aspects of process management in my opinion too. Whether you consider BPM as a modeling discipline, as a system development discipline, or as a methodology, the chances are that with one or two notable exceptions the leading players of tomorrow may not even be in the market yet! At Signavio, we constantly monitor competition, not from within our market, but from outside, considering who or why someone may move towards what we do and what impact it might have on us. 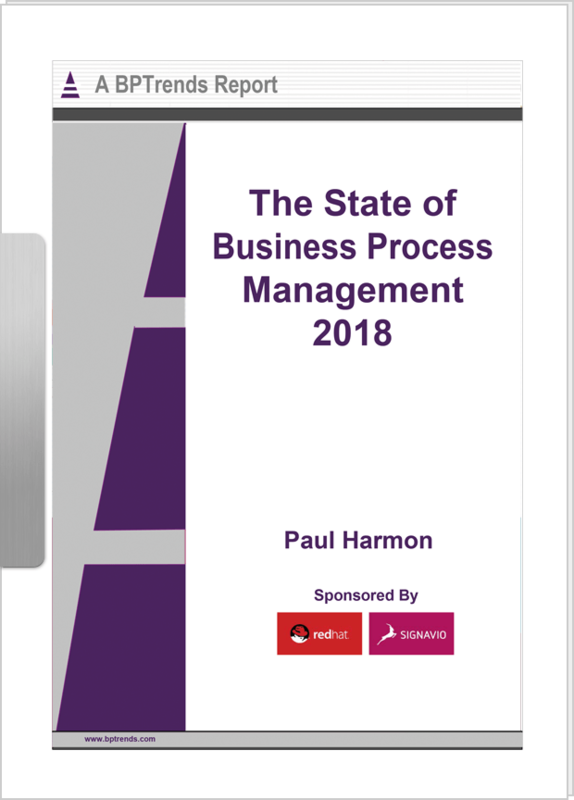 As an example, look at the new vendors in the robotic process automation space, who are going great guns selling process automation systems against traditional BPM software players, or the great interest being shown in process mining and process intelligence. These fields are both new and fragments at the same time, but they are winning the battle for hearts and minds because the value proposition is easier to understand. Using BPM software as an example, most of the so called “leading players” over the early part of the century have come and gone. Some have morphed into other areas like packaged applications or software development, some were sold on as organizations, and some simply disappeared. Yet, if we look at the amount of money spent on process automation today, we can see that a healthy and growing market exists—it just isn’t the market that people thought it was 10-15 years ago. Like the world as a whole, it has moved on. So with these changes in mind, and looking specifically at the process tool market, where do you see things headed over the next one or two years? What I see, as a result of the efforts of Signavio and one or two others, is that process modeling will generate significant renewed interest. In many ways, it seems there is a perfect storm brewing that will elevate the value and need for process modeling to the next level in organizations. On the part of the tools, it is the combination of power, ease of use and democratization of process mining as well as of process modeling itself. From a technological point of view, it is the urgent need to almost totally transform an organization’s technology landscape to get costs under control, and dispose of historical systems that actually hold organizations back. The third element, driven in part by the nature of digital business, is the need to completely rethink how we do business. When looked at like this, to rethink how you do business means to rethink processes. To change systems, you need to think about what information you need to be delivered, how, and when. In other words, it starts and ends with process! You then have to ask yourself how you can get input on all the levers quickly and effectively, which means engaging your whole organization and leveraging the wisdom of the crowd, not just relying on a few experts. To summarize: It is less about the tools themselves, and more about the urgency to increase their use. I’m not sure I see massive changes in process modeling tools over the next 12-24 months, at least in terms of functionality, with one notable exception. As Gero noted in his 2019 BPM predictions, customer experience must become the ‘North Star’ for any organization seeking to be successful. 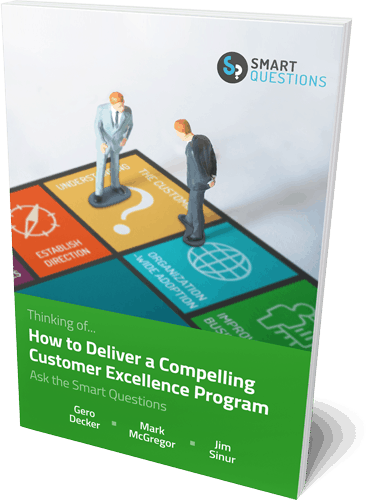 Many may say they are already focusing on the customer with existing Operational Excellence approaches, but unfortunately, I believe, for the most part, they are fooling themselves. Simply managing your existing processes in an end to end way does not address new business models or highlight real risks and opportunities. There is a more modern and better way of doing that—making better use of customer journey maps. Customer journey maps enable us to get a different perspective, and help to ensure we focus on doing the right things right. There it is! Mark, we know you are passionate about customer journeys and journey mapping. We’ve heard you present webinars, seen your blogs on the subject, and we have even read the early work you did on this almost 15 years ago. We know your passion has never wavered, but why is that so? You are right, I do care about it a lot, possibly even too much! But it truly excites me to watch how easily and quickly organizations can transform when they use this technique. I have watched Global 1000 organizations save or make millions of dollars, just as the result of running 3-5 day customer journey exercises with small teams of business users. I have also witnessed first-hand how sharing journey maps within organizations enables groups of people to have greater purpose, generate new ideas, and support change efforts where they resisted before. Now, of course, it is not that simple, and there are some barriers that prevent people from achieving the maximum potential of customer journey mapping (CJM). The first is that people all too often rely on Google to research a topic, and when it comes to customer journeys they inevitably come across site after site, definition after definition of CJM that speaks of it as a marketing tool, one which only addresses sales and marketing, while also requiring a great deal of in-depth customer research. It is true that this is one application, but it can be used for so much more. The second barrier is process modelers and process professionals! I find it amazing how many of them simply try to recreate a process model/map/flowchart—they insist on putting gateways and multiple paths in place. In my experience process people often struggle with the idea that you pick a persona, pick a trigger, pick an outcome, and then simply map out the “happy” path. If you want to map an “unhappy” path, then simply change your outcome and draw another map! Don’t try and mix them. The third barrier is the fault of tool vendors, several of whom now claim to support customer journey maps. However, as I suggested earlier, instead of thinking about what the best way of creating and sharing them is, they have taken the concept and tried to fit it into their existing world. In other words, while the best customer journey maps are fluid and almost free form, the vendors have turned them either into spreadsheets or pseudo flow charts, missing some of the main benefits of journey maps. At the risk of doing a selling job for Signavio here, this is what I think is amazing about the support Signavio has added. Not just creating images, but allowing us to then connect to the processes that deliver the experiences or steps we are capturing. This separation of concerns allows everyone in the business to comprehend via journey maps what is happening, while enabling process professionals to act on the details that underlie the experiences. Of course, I am not alone in seeing this about Signavio. Aragon Research, having named Signavio first as a Hot Vendor™ in Customer Journey Mapping, and now in 2019 as a “compelling new leader” in their 2019 Tech Spectrum™ for customer journey mapping, think so too! If you’re interested in better understanding your customers’ journey, or are tackling a business transformation initiative of your own, Signavio can help. You can download a free 7 Step Guide to Effective Business Transformation, or sign up for a free 30-day trial today to see how Signavio can help your business plan for future challenges, and take advantage of future opportunities.